Jesus did these things to make happen what Isaiah the prophet said. Isaiah said, "Here is my servant; I (God) have chosen him. I love him, and I am pleased with him; I will put my Spirit on him, and he will judge the nations fairly." 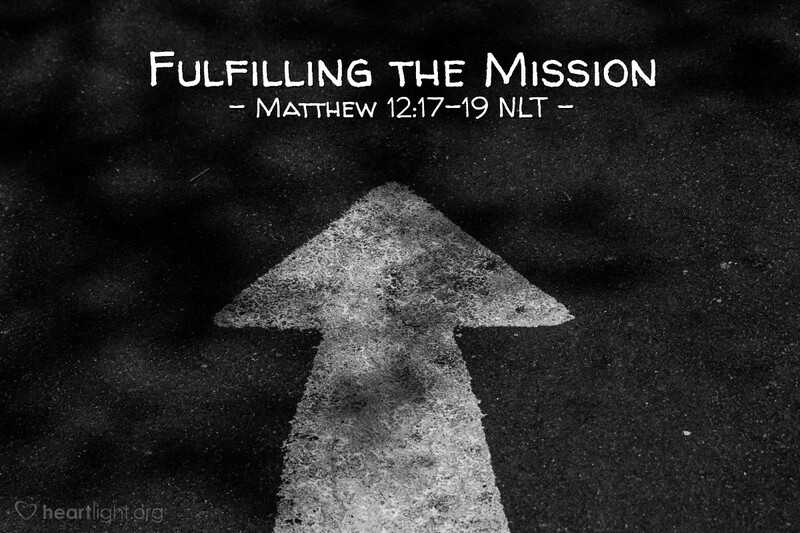 Jesus is clearly living out of a sense of mission or calling. He is doing the Father's will. Powerfully at his baptism and at his transfiguration, Jesus is declared by God to be his Son, whom he loves. Once again we are reminded that Jesus is chosen by God to be his servant (son) whom he loves and who brings him pleasure. In addition, his ministry is carried out by the power of the Holy Spirit and its purpose is to share God's love, mercy and justice—specifically what Jesus has been doing. In much the same way, we are called, chosen, and empowered by God through his Holy Spirit. He lives in us and our goal is to bring God pleasure and to do his will. We are God's children and Jesus' disciples. So the real question is whether or not we're trying to live by the power of his Spirit and having as our goal in life pleasing him and sharing his grace with others! Abba Father, please help me to find your will for my life so that I may serve you with undiluted devotion and bring you pleasure. Please forgive me when I get caught up in things that are not healthy for me spiritually and not helpful for my brothers and sisters in Christ. Please bless me with the wisdom to know what is best to do to honor you today and each day of the rest of my life. In Jesus' name, and because of his grace, I pray. Amen.